Amazing footage of the rocket's descent is making the rounds on social media. SpaceX’s achievement of landing a rocket on a tiny platform in the middle of the ocean is incredible enough — but wait until you see this video attached to the rocket as it makes its descent. 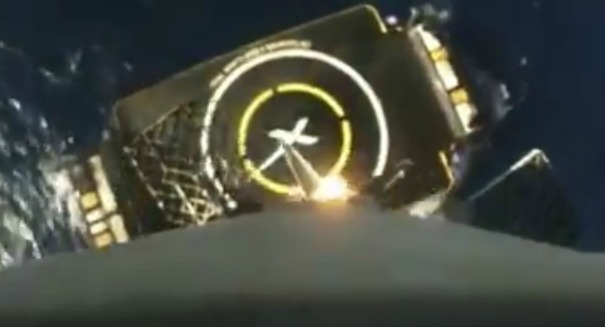 SpaceX on May 27 made its fourth successful landing of a Falcon 9 rocket onto a platform in the middle of the ocean after launching from Cape Canaveral, Florida to deliver a Thaicom 8 satellite. Just 10 minutes later, it was sitting quietly on a landing pad, and you can watch the last 30 seconds of its descent below. The rocket comes hurtling toward the ocean at incredible speed that would seem impossible for it to recover from. Even just a moment before landing, it was moving at a speed far too fast to prevent total loss, but at just the right moment, the boosters fire and land it gently and almost anticlimatically on the platform. The platform was located in the Atlantic Ocean about 420 miles from the Florida coast. Staff at SpaceX headquarters in California erupted in cheers after touchdown, according to a Phys.org report. It was a tense moment when it neared the platform, as the feed cut out just before. But when it returned there was the rocket, standing tall and proud. SpaceX CEO Elon Musk on Twitter showed reserved happiness with the landing, remarking that there was some concern about the back and forth motion that could result in the rocket tipping over in some cases, implying that it would need to be addressed.